Pre-ordered the collector's edition at Itech SM North! Ilang slots na lang open for collector's tapos ubos na yung premium so bilisan niyo na sa mga gusto makakuha ng collector's ed! ano nga ba nasa collector's edition? ^ 7 inch statue ni Sir Galahad and Steel Book and stickers. May access din sa complete soundtrack (which is pretty good) and behind the scenes video. Hindi ako mahilig sa mga figure, sa totoo lang Steel Book lang habol ko, so baka ibenta ko yung figure. Lycan gif para sa hype! I'm still having a hard time getting over my cynicism regarding this game. All that RAD have shown so far are standard TPS and QTE gameplay. I've heard about some form of investigating but i'm not sure if that's an actual mechanic or just some story beat. I hope there's something more noteworthy about the game than just looking pretty. They seem like a talented bunch, but i'd rather the game didn't occupy more or less the same space as Naughty Dog's cinematic TPS approach. Failing that, i at least wish that they can tell a good story. Games could always use more of those. Or Guerilla's robot dinosaurs. Now that, i'm realy curious about. 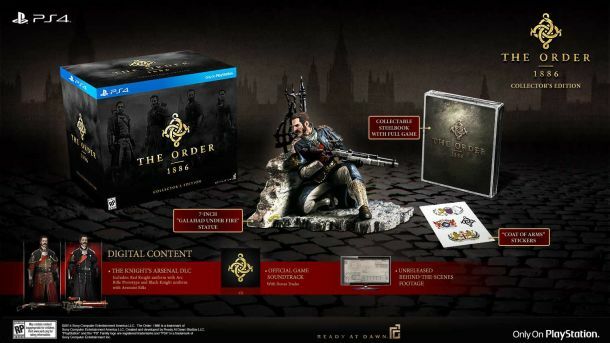 Okay time to pre-order the Premium Edition. Nag restock Amazon today ... bili na baka maubusan kayo. Sabi na nga ba mag restock ang Amazon, just like tales of symphonia before. ^ Got my collector's edition pre-ordered here locally, masyado mahal yung premium para sa akin pero ang ganda nung figure! Also, would advise everybody to watch out for spoilers, a lot of people have early copies already. Also, ako na gagawa ng OT, so claimed na yung ot! !